I didn’t ask them to bring their Thanksgiving Dinner forward a week, though it was flattering to be accorded that honour, even if, as a vegetarian, I was loath to eat the turkey or the pork on offer. 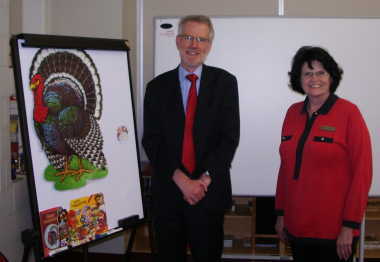 The photo shows a victim (it’s not the bird that gives thanks, we assume) with Suzanne Dreyer and me in the library of Stacey High School at Lackland Air Force base in San Antonio, Texas. Suzanne is Instructional Technologist at Lackland, which involves supporting technology for learning ‘K-12’ (that is, from Kindergarten to the end of high school) – and being a kind of ‘super-teacher’ as well. The tour of the school was an invaluable introduction to the whole range of US schooling – though I was told Lackland isn’t really typical and I could see that Suzanne is exceptionally committed to making the most of the technology. The Annual Convention of NCTE (which is the US equivalent of NATE) which Julie Blake, Tim Shortis, Andy Goodwyn and I attended for the next four and a half days, merits more than I have time for tonight. Suffice it to say that we were warmly received and were able to engage in a fascinating exchange of ideas. Chris Warren’s collapsed text idea has now appeared on the US website, LitArchives.com, created by Allan Webb of Western Michigan University. 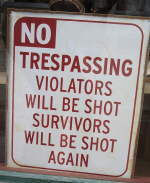 And just to make it clear that despite the notice here, we received a warm welcome wherever we went! Armistice Day this year has seen a particularly rich harvest of material for those interested in the literature of the First World War, coming as it does 90 years after the last shots were fired. The Guardian‘s excellent series of booklets, with a wallchart on propaganda, provided a very accessible overview with plenty of examples from poetry, reminiscences and art as well as the historical background. The complete series, or missing booklets, can now be ordered here. Much of the material in the booklets can also be found online, here along with other material on the war. The Guardian also carried a moving interview with Harry Patch, the last surviving British soldier who fought in the trenches, by Andrew Motion, and a short video on the Battle of the Somme. Oxford University has also just launched a much enhanced version of its excellent First World War Poetry Digital Archive. At our consortium meeting yesterday, Nadine was an enthusiastic advocate of All Quiet on the Home Front , ‘An Oral History of Life in Britain During the First World War’, by Steve Humphries and Richard van Emden, which she praised for the valuable first-hand accounts to balance the poetry from the front line. Someone reminded us of the value of the approach in Oh! What a Lovely War – script from 1967 and film version in 1969 (remembering the context in which it was produced). And I didn’t even have time to mention, or play extracts from, The Pity of War : a collection of elegiac First World War works by Elgar, Janacek, Debussy with a second disc of Wilfred Owen letters and poems read by Samuel West, interspersed with wartime songs. For literature teachers, the second disk alone is worth the price. Finally, for a broader overview, I can commend James Anderson Winn’s The Poetry of War , a wide-ranging study of war poetry from Homer to Bruce Springsteen. My review in NATE’s English Drama Media can be found here.